If there is a better name for a swamp than the "Great Dismal Swamp" I am unaware of it. It speaks of all the things you might imagine of a swamp where Bogart and Hepburn pull their boat heroically through mud while fending off mosquitoes, leeches and despair. It sounds like something that should be in the "The Princess Bride" hosting R.O.U.S.s or their kin. Of course, unlike the Fire Swamp where Wesley and Buttercup venture, The Great Dismal Swamp is a real place, located along the borders of southeastern Virginia and northeastern North Carolina. 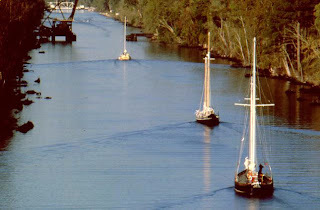 The Dismal Swamp Canal and the Albemarle and Chesapeake Canal form alternative routes along the Atlantic Intracoastal Waterway (AIWW) between the Chesapeake Bay and Albemarle Sound. The canals and the rest of the waterway are maintained and cared for by the United States Army Corps of Engineers. The AIWW provides pleasure boaters and commercial shippers with a protected inland channel between Norfolk, Virginia and Miami, Florida. The history of these two canals, which contain the only locks along the AIWW, paints a vivid picture of the development of transportation that goes back over two hundred years. It is also a fascinating tale rich in folklore and literature. his party had to struggle through the dense undergrowth and forests of the great swamp. Byrd, finding the place repulsive, is said to be responsible for the addition of “Dismal” to the name. It would be nearly 60 years, following the Revolutionary War, before a canal was begun. The new nation desperately needed good roads connecting the isolated towns and villages with larger cities. If the country was to grow and prosper, an effective means of internal transportation had to be developed. Both George Washington and Patrick Henry felt that canals were the easiest answer and favored a route through the Dismal Swamp. Although Washington was not involved in the canal’s construction, he was familiar with the region. He and a group of business “adventurers” owned some 50,000 acres in the Dismal Swamp that they were logging. Washington Ditch, a separate cut through the swamp, was built to transport their timber. The remnants of it are still visible today. Finally, in 1793, construction began on both ends of the Dismal Swamp Canal. The canal had to be dug completely by hand so progress was slow and expensive. Most of the labor was done by slaves hired from nearby landowners. It is interesting to note that the slaves became so familiar with the swamp during this period that it eventually became a haven for runaways. 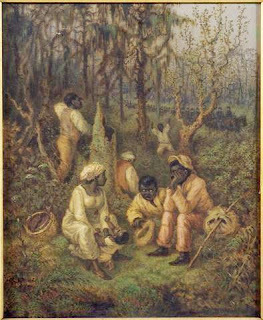 Later, in the anti-slavery era prior to the Civil War, “Harper’s Weekly” artist David Strother visited the area and reported that there were large colonies of runaway slaves in some sections of the swamp. Harriet Beecher Stowe patterned her main character in the novel, “Dred: A Tale of the Great Dismal Swamp,” on one of Strother’s sketches. Henry Wadsworth Longfellow was inspired to pen his poem, “The Slave in the Dismal Swamp,” based on Stowe’s character. By 1796, the costs of building the canal had far exceeded the projected estimates. The company halted work and began a road to connect the two canal sections. The road was completed in 1802. The famous Irish poet, Sir Thomas Moore, visited the area soon after and immortalized “The Lake of the Great Dismal” in a ballad about a legendary love affair. The completed canal would eventually open in 1805, twelve years after it was begun. Because it was so shallow, its use was limited to flat boats and log rafts that were manually poled or towed through. Shipments consisted mainly of logs, shingles, and other wood products taken from the swamp’s great stands of cedar and juniper. Needless to say, this was a far cry from what farmers, lumbermen and merchants originally envisioned as a regional trade route. Throughout its history, the Dismal Swamp Canal has experienced hard times. The owners would give up trying to maintain it, let it fall into disrepair and eventually sell it. The maintenance problems were the result of flaws in the canal’s original concept and design. Water levels between its beginnings in Deep Creek and its original end in Joyce’s Creek were not correctly measured. This left the canal without an adequate source of water and subject to natural rainfall and drainage conditions. Even with the feeder ditch built to supply water from Lake Drummond, the canal was still dry in periods of low rainfall and drought. The problem remains, even today. 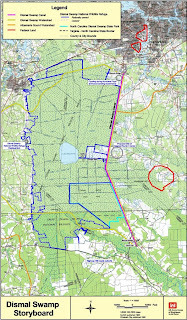 To preserve water levels in the federally protected Great Dismal Swamp National Wildlife Refuge, the feeder ditch is periodically shut off during dry spells. This prevents the canal from draining waters of the swamp and damaging its fragile ecosystem. 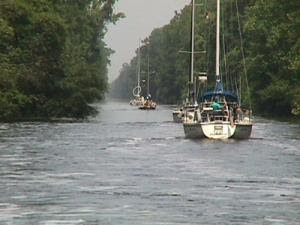 The Dismal Swamp Canal is the oldest operating artificial waterway in the United States. It is also rich in history and folklore. Visitors and canal navigators travel where famous explorers and presidents have stood and literary greats have been inspired for over two hundred years. For example, astride the two states’ border is the site where the infamous “Halfway House” hotel was built in the late 1820’s. The hotel was a popular spot for marriages, duels and those escaping the law. Since the hotel was on the state line, this last group simply walked to the other side of the hotel to avoid being captured in either state. It is also said that Edgar Allen Poe wrote “The Raven” during one of his stays at the hotel. And, as you follow the canal, you retrace the course of James Adams’ Floating Theatre, where Edna Ferber got the idea to write the novel “Showboat” upon which the famous musical is based. Today, the Dismal Swamp Canal is on the National Register of Historic Places as a Historic Landmark, and is also noted as a National Historic Civil Engineering Landmark. In February 2004, the Dismal Swamp Canal was included in the National Park Service’s Underground Railroad Network to Freedom Program. It is maintained by The U.S. Army Corps of Engineers as a navigational resource along the Atlantic Intracoastal Waterway. Before the days of refrigeration, water from the swamp was a highly prized commodity on sailing ships. Chemically sterile, the water stayed fresh for long periods when stored in wooden kegs. When Admiral Perry his famous "Open Door Trip to Japan? in 1852, he carried Dismal Swamp water on his ships. Union ships carried large quantities of Dismal Swamp water during the Civil War to avoid sailing back to Washington, D.C. Those who have tasted the dark brown water claim that it is quite drinkable. They liken its taste to sassafras tea, which is also rich in tannic acid. to Norfolk. No attempts were made to capture the Dismal Swamp Canal until two months later. The Union, fearing that the Confederates planned to send an ironclad to the Albemarle Sound via the canal, mounted an expedition to block the canal. On April 17, 1862, 3,000 men commanded by Brig. Gen. J.L. Reno marched toward South Mills where the Confederates had constructed fortifications. A brisk but brief engagement occurred at South Mills on April 19. The Confederates were forced to retreat, however, the Union forces were unable to destroy the locks at South Mills. 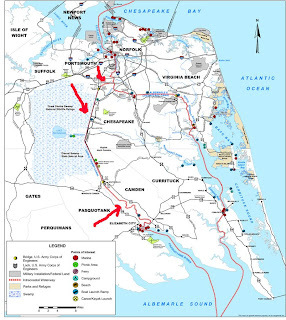 The Union gained control of the canal shortly after the fall of Norfolk on May 10, 1862. Yet, by 1863 their control over the region was tenuous. 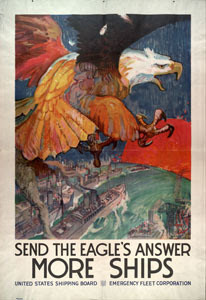 Great quantities of supplies were smuggled through the canal by Southern sympathizers and Confederate guerrillas annoyed the Federals with their periodic raids. Maintained to a depth of 6 feet, however, boaters should verify the latest channel conditions. Our locks and bridges have minimum operating staff on duty from 8:00 a.m. to 4:30 p.m., 7 days a week, 365 days a year. Deep Creek and South Mills Locks normal operating schedule is: openings at 8:30 a.m., 11:00 a.m., 1:30 p.m., and 3:30 p.m., 7 days a week, 365 days a year. The schedule is subject to change during droughts or adverse weather conditions; call to confer before transiting the canal. Drawbridges at Deep Creek and South Mills are unmanned and open in conjunction with the lock operating schedule. The lock operator also serves as bridge operator, therefore cannot be in both locations at the same time. Some delays in the opening can be expected, as they will be coordinated with the adjacent locks. Deep Creek Lock and Bridge operators can be reached at (757) 487-0831, the South Mills Lock and Bridge operators can be reached at (252) 771-5906 or marine radio channel 13. Boats can anchor or moor overnight in canal; limited tie-up facilities are located along the canal. The Dismal Swamp Canal Visitor Center, built by the North Carolina Department of Transportation, is located near mile marker 28 on the canal. The Visitor Center has a variety of published brochures and pamphlets with information on accommodations and attractions, 150’ dock, canoe/kayak launch, restrooms, vending machines, picnic tables, and grills. 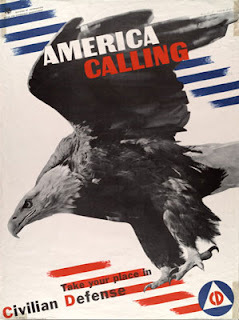 Call (252) 771-8333 or visit www.dismalswamp.com for additional Visitor Center information. You need to be careful transiting the canal, but if you stay in the middle, any boat with a 6-foot draft or less shouldn’t have any problems. Overhanging branches reach over the canal from either side, so you have to learn to look up, as well as forward, to make sure your mast stays clear. However, there’s a wide opening between the branches, so stay in the middle to avoid them. You may also find some debris of logs or branches, but keep your eyes open to steer clear of them and you’ll be fine. It’s no worse than other parts of the ICW. We’ve encouraged many to try the canal and they rave about it once they have traveled through it. 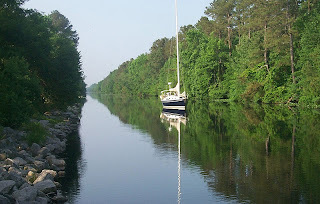 The scenery and peacefulness of the Dismal Swamp Canal and the Pasquotank River is hard to explain; it’s something you need to experience yourself. Even though I have not seen the movie, my Dad said that it reminded him of the trip down the Amazon River in the movie “African Queen”. The Great Dismal Swamp is also home to a National Wildlife Refuge. North Carolina has nice Welcome Center on the Canal. 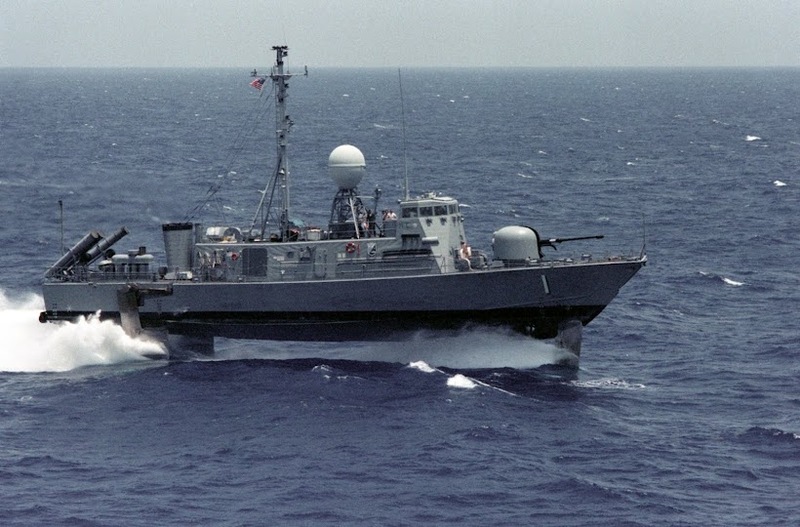 "Yemeni Fishing Ship Blows Up in Sudanese Waters"
U.S. Navy Future: 200 ships? Sunday Ship History: "Torpedo Juice"
Somali Pirates: "Where are the Escorts?" Somali Pirates: Another "Beginning of the End?" Somali Pirates: "The Ship was never taken"